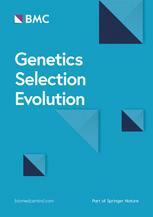 Reputed for thorough and constructive review, Genetics Selection Evolution is dedicated to publishing original research on all aspects of genetics and selection in domestic animal species, and other species providing results of immediate interest for farm animals' genetics. An official journal of the French National Institute for Agricultural Research (INRA), the journal provides a high-visibility forum for the dissemination of research that will prompt new insights and discussions in the animal genetics field. All articles are indexed in PubMed, Scopus, Web of Science and HAL.